This project is about challenging people’s ideas about older LGBTI women; it’s about our feisty over-55 upitty women. We want to pull apart the clichés about women and aging; about the diminishing of sexuality and the relaxation of passions; about what older dykes and queers and lezzos wear and think and believe. Diversity, political awareness and activism, style and beauty, so valued and represented in youth-oriented queer cultures, is not the sole purview of the young, and this project aims to represent—through collaboration, photographic portraits, and interviews—the older LGBTI woman. This project aims to record the history of women who have been, and the women who still are, involved in lesbian, feminist, gay, bisexual, transgender, intersex and queer activism and culture, but also to represent that we are still here. That age does not make us irrelevant, asexual, harmless, style-less, conservative, invisible, or insignificant. This project will create an archive, but a living archive, not to be merely relegated to dusty ‘history’, but a present-archive, mapping and representing our past, our present and our visions of the future. 55Upitty acknowledges the traditional owners of the land. We acknowledge their care of this land over many generations, celebrate their ongoing achievements in today’s society and acknowledge the terrible wrongs that have been committed against the Aboriginal peoples of Australia. 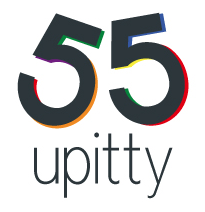 55Upitty is a collaborative interview and photography project by Teresa Savage, with photographers Viv McGregor and Kerry Fluhr, with thanks to all our 55Upitty stars. Logo design is by Emily Spencer. Email 55upitty@gmail.com to contact Teresa, Viv, Kerry or Emily.